Comet 302660-A. 30mm, 1:10 taper bore, requires 15/16" W Belt (symmetric). Fits Club Car Golf cars 1997 & up. Home > Comet Clutches and Parts > Comet 302610C. Comet Industries 780 Series Drive Unit. 1" Bore. > Comet 302289A - Pack of 6 "Black" replacement springs > Comet 302660A. Comet 858 Series Drive Clutch with Alternator pulley. Comet 302660A. Comet 858 Series Drive Clutch with Alternator pulley. Comet 302660A. 30mm, 1:10 taper bore, requires 15/16" W Belt (symmetric). Fits Club Car Golf cars 1997 & up. 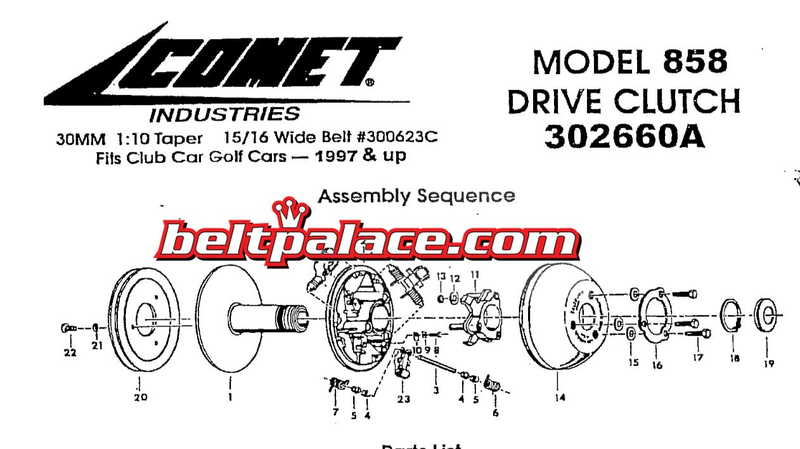 Genuine Comet 858 Series Drive Clutch with Alternator pulley (Comet 302659-A). Factory equipped with Black Spring Kit, 79 gram roller weights, and 7" alternator pulley. Comet 300623 (A/DF) CVT Belt. Replaces Comet Industries Belt 704041. Comet 300623 (A/DF) CVT Belt. 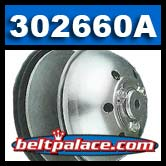 Replaces Comet Industries Belt 704041 for Comet 500 and Comet 858 Series clutch systems. Comet 302289A - Pack of 6 "Black" 780/500 Series Drive Clutch replacement Spring Kit, Black. Comet 301040A Roller Weight Kit - 79 grams. Optional/Custom installation with Comet Industries 780/500 Series Drive units.